How to Install the Splashtop SOS Plug-In for Spiceworks Help Desk - Splashtop Inc. If you are looking for an easy way to provide on-demand support from within Spiceworks Help Desk, Splashtop SOS and the Splashtop SOS Plug-in for Spiceworks is a great way to do it. With Splashtop SOS, you can provide quick attended support to your end users on their computers (Windows or Mac) or mobile devices (iOS or Android). The end user downloads and runs a simple app and gives you the 9-digit code from their screen. You enter it in your Splashtop app and you can remotely access and view their devices. You can also remotely control their Windows or Mac computer and many Android devices. You can do all of the steps below and try it out with a free trial of Splashtop SOS or use a purchased license. Compare SOS to the competition and you’ll find it’s the most cost effective way to provide remote support for computers and mobile devices. How do I install the Splashtop SOS Plug-In for Spiceworks Help Desk? First, make sure you have Spiceworks Help Desk. If you don’t, you can get it for free. 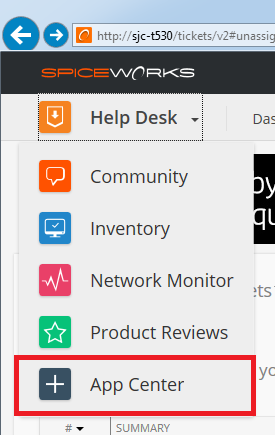 Or, when you are logged into Spiceworks Help Desk, select “App Center” from the main drop-down menu. Then search for the Splashtop SOS Plug-In. Click the “Install” button to install it. If you see the error “We can’t see your Spiceworks Desktop and this will prevent you from installing this plugin. Login to your Spiceworks Desktop app and go to Apps > App Center to get connected and then come right back to get this plugin.”, there are a couple things you can try to resolve it. If you end up installing the plug-in with a different browser, don’t worry. The plug-in will show up and work fine in Chrome after you get it installed. How do I know if the SOS Plug-In for Spiceworks has been successfully installed? You will see a listing in the Spiceworks “Manage Apps” screen for Splashtop SOS. You will see these two items (circled in red below) at the top of your tickets. Our next article will go into more detail on starting a remote support session. If you’re looking for a great combination of a help desk system and remote support solution, you get started with it all for free with a few simple downloads and the instructions on this page.